The UC Davis Department of Philosophy cultivates a thriving community of collegial discussion groups for undergraduate and graduate students. Philosophers know how to have fun. Undergraduate and graduate students, faculty members, and folks who are curious about philosophy meet for an afternoon of free pizza and discussion on a variety of issues in the Philosophy Department Library. The UC Davis Department of Philosophy's Food for Thought event is held during the fall and spring quarters. The Davis Group in Ethics and Related Subjects (DaGERS) evolved from a workshop for graduate students and faculty with interests in normative philosophy. The group meets weekly during academic quarters to discuss work in progress, including chapters of dissertations or other papers by graduate students, and also, occasionally, papers by faculty members or visitors from other universities. Undergraduate Philosophically Oriented Women (u-POW) is a group that offers mentorship for undergraduate women in philosophy. Women are greatly underrepresented in the field of philosophy, as statistics compiled by the Society for Women in Philosophy reveal. Quarterly meetings of u-POW are devoted to topics that include succeeding academically as one of the few females in the classroom, the climate of the discipline, and applying to graduate school. 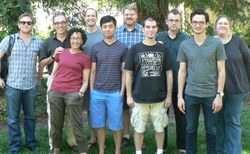 The Davis Logic, Language, Epistemology, and Mathematics Working Group (LLEMa), hosts weekly meetings in which participants discuss current work on issues relating to logic, philosophy of language, epistemology, and philosophy of mathematics. The Department of Philosophy also sponsors a UC Davis faculty-led quarter abroad program at the London School of Economics and Politics, among other enrichment opportunities.